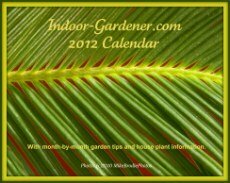 If you have -- like I do -- a plant or two (or a dozen) in your home or office -- you're an Indoor Gardener -- as simple as that! The trick to successful indoor gardening, however, is a little more complex - but still easy. And let's not forget the most important ingredient -- a little love for your houseplants. I don't know about you, but I receive much more from my plants than I could ever give them. Wherever I am there's a little bit of the natural world right next to me. The benefits are many, including better air, a relaxing hobby, and the beauty living plants supply. Recently I moved from a home with five (small) outdoor gardens -- that was the hardest part of leaving Nashville. Moving state to state, I couldn't take any with me so I dug up my favorites and gave my green friends to my human friends. Now I live in a multi-unit building and while the landscapers do an amazing job with the plantings, I can't help with it -- not even the weeding. I started this website because I love plants and I can't live happily without them. When I found that I couldn't garden outside, I decided to increase my garden within my apartment. 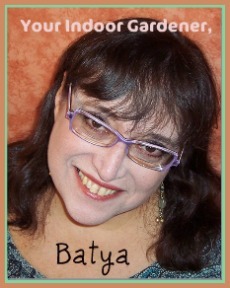 I can still put my hands in the soil, trim, shape, plant, prune, propagate, and live in the company of living greenery. Here are some of my houseplants hanging out in their new home. Some of you who find this website live in apartments or homes with little outdoor space. Others of you will have lots of outdoor gardens but want houseplants as well. 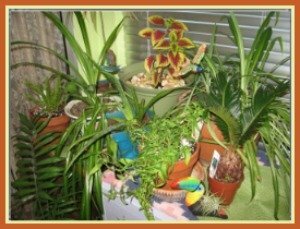 I hope you all share my passion for growing houseplants and that the information and supplies on these pages help you become successful indoor gardeners! So put on your gloves (if you use them), grab your trowel (or spoon), bring along your favorite green friends, and let's explore the world of bringing the outdoors in! To read about these and other topics, use the navbar in the left column for our main pages: those connect to pages with more detail on the topics. There's also a search box at the top of Right Column on most pages that will help you find what you're looking for on the site. I'll be adding many more pages, including individual plants and their specific needs; the best supplies; decorating ideas; and creative ways to share your love of gardening in your home or office with others. If there's a topic you'd like me to cover in more depth, please use this link to let me know.